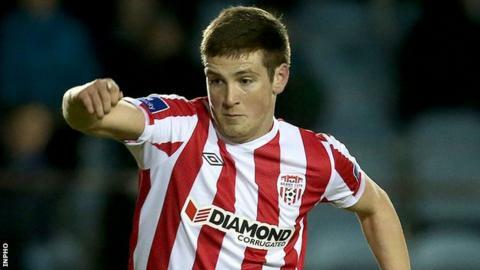 Derry City's Patrick McEleney has moved to League of Ireland champions Dundalk after failing to agree a new deal with the Brandywell club. McEleney told the Derry Journal he had been offered "basically the same" deal as last year and that he had then been approached by St Pat's and Dundalk. The midfielder agreed a two-year deal with Dundalk on Tuesday in what will be regarded as a major blow for Derry. "I was disappointed with the way Derry handled it," said the 23-year-old. New Derry City manager Kenny Shiels said that he was "disappointed" with McEleney's decision. "I'm not disappointed in Patrick, I'm just disappointed for Patrick because I feel myself and my management team would have been the perfect fit for him," added Shiels. "From a footballing point of view I think it's not the best move for Patrick but it's one he's made and I respect that." However, McEleney suggested that Derry hadn't tried particularly hard to keep him at the Brandywell. "They didn't come back with a counter offer or to have any further discussions," added McEleney, who has played at youth level for both Northern Ireland and the Republic of Ireland. "I got one offer and that was it. It was down to the club if they wanted me or not and I would have considered other offers." McEleney was arguably Derry's best player this year while Dundalk have also added to the squad by signing UCD's Robbie Benson.